A modular solution built on blockchain, benefiting all network participants with a safer, smarter and more sustainable food ecosystem. IBM Food Trust is a collaborative network of growers, processors, wholesalers, distributors, manufacturers, retailers, and others, enhancing visibility and accountability across the food supply chain. Built on IBM Blockchain, this solution connects participants through a permissioned, immutable and shared record of food provenance, transaction data, processing details, and more. 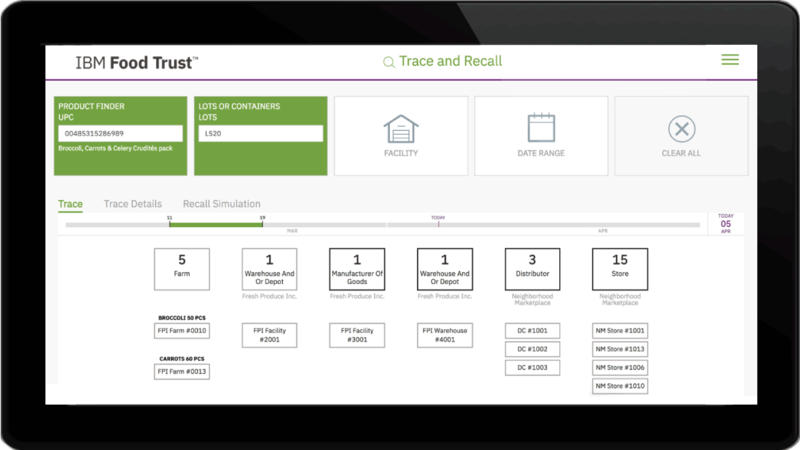 Securely trace the location and status of food products beyond the one-up, one-down process including a farm-to-store view, multi-ingredient view, and essential details at every step. With digitizing standards compliance, users can access information, provide provenance and manage certifications, and share single-sourced inspection and quality certifications and registrations. Share data from your food system only with need-to-know partners in a secure and confidential environment that leverages global standards. This service is provisioned by invitation only. Choose modules to address your business needs. Available ONLY to companies who send and receive goods in the food supply chain (< $50M). Choose modules to address your business needs. Available ONLY to companies who send and receive goods in the food supply chain ($50M - $1B). Choose modules to address your business needs. Available ONLY to companies who send and receive goods in the food supply chain ($1B+). Engage with IBM Food Trust experts to receive hands-on virtual onboarding. Available as an add-on to your existing subscription.